Visitors photograph the Rockefeller Center Christmas tree during the 2007 holiday season. 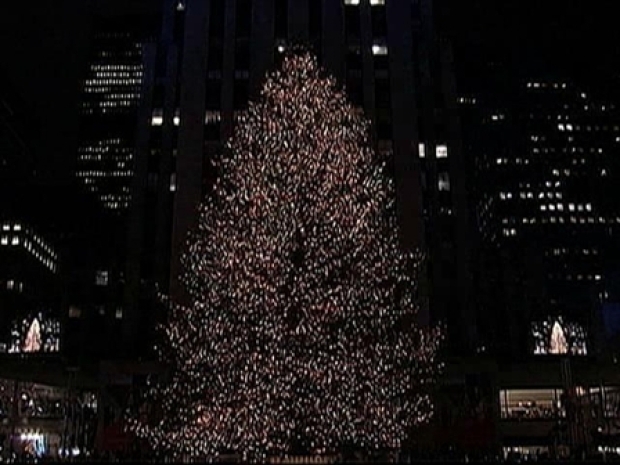 Christmas at New York City's Rockfeller Center will feature a tree from western New Jersey that its owners call a "miracle." Workers are cutting down the 72-foot tall Norway spruce on the grounds of Tree King nursery in Hamilton, which is owned by the Varanyak family. The 8-ton tree will be erected over the ice rink on Friday. Bill Varanyak tells New York's WNBC-TV the 77-year-old tree was planted after his parent's used it as their first Christmas tree in 1931. It takes a whole lot of work to become the most important tree in America. He says it's "the miracle tree" because his late mother always said it would one day be on display at Rockefeller Center. His brother, Bob, says they recently saw a blue bird in the tree and they believe the bird was their mother guarding it. While the first official lighting was in 1933, the first Rockefeller Christmas tree was put up two years earlier by workers helping to build the complex during the Depression.